The findings could be a sign of what’s to come as the Puget Sound area considers a massive transit expansion along with new homes near stations. As Seattle and surrounding cities look to significantly expand train service throughout the region, here’s fair warning for those looking to live the car-free lifestyle: If you want to live near a transit hub, you’ll likely have to pay up. Seattle-based real-estate firm Estately crunched the data on the median cost so far this year to buy a home within a mile of each existing and forthcoming Link light-rail station — and how that compares with other home values in the region. The results were clear: Take the Capitol Hill station, which just opened in March. Already, homes sold near the station are going for a median price of $505,000, or $35,000 more than the rest of the neighborhood. On Beacon Hill, south of the stadiums, buyers near the station paid a typical price of $516,000 this year, an extra $61,000 compared with other homes in the area. In Pioneer Square, the extra cost near the station is $78,000. Looking for something cheaper? In Tukwila, the cost to buy a house near that city’s station this year has been $340,000, or $88,000 more than the rest of town. How about the forthcoming light- rail stations on the Eastside, where communities are already planning for new homes in transit villages? In Bellevue, houses near four of the five coming stations have sold this year for a typical price of $775,000 to $800,000, vs. $710,000 citywide. The findings echo studies done in other cities. Economist Matthew Gardner, who has studied the issue of housing costs near Seattle transit in the past, said the cost premium to live closer to the train will only grow as traffic gets worse, light rail expands, and a rising number of millennials and others look to ditch their cars. The report doesn’t seek to answer whether the stations themselves are driving up costs, or if those stops just happen to be in high-cost areas. “Potentially you can be further out than living in Queen Anne but still pay more because of that convenience living close to transit,” said Gardner, the chief economist at Windermere Real Estate. The issue has grown in recent years as more and more people have been priced out of the Seattle core and have moved to outlying neighborhoods and suburbs, where many commuters want to ride transit to work to avoid punishing traffic. The potential to do that is limited by the relatively small size of the light-rail system today, but the network is growing and more large developments are popping up near stations. Most significantly, Puget Sound area voters are weighing the $54 billion ST3 transit expansion, which officials on Thursday placed on the November ballot. That package could produce dozens of new stations over the next quarter-century, generating nearby housing that could allow more people priced out of expensive areas to live farther away and ride the train to work. The Estately study doesn’t look at the possible stations included in the ballot measure, but it does examine housing costs near existing Link stations and new ones that are already under construction or approved on the Eastside and north and south of Seattle. Many of those stations won’t open until the early part of the next decade, but cities are already planning for transit villages near them. Gardner said if the ballot measure is approved, property values would “absolutely” rise near the stations included in the expansion, which would stretch to West Seattle, Ballard, Issaquah, Tacoma and Everett. The good news — other than for property owners sitting on land near proposed stations — is that Seattle hasn’t seen quite the same added cost premium as other cities for homes along the rail line, said Estately CEO Galen Ward. That’s largely because the train line here simply isn’t as useful as other places with more robust transit systems. Ward’s company has done similar analyses for costs near train lines in the Bay Area, Washington, D.C., Chicago, Boston and Atlanta. 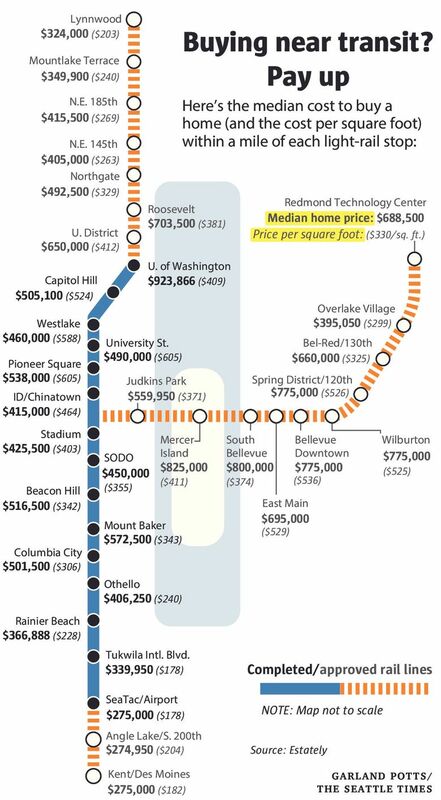 And while the added cost premium to live near the train is smaller in Seattle, the overall prices aren’t. Homes near transit in central Seattle and the Eastside are considerably more expensive than along rail lines in Chicago and Atlanta, and similar to those in Boston and D.C. But as always, the Bay Area takes the cake: Homes along that region’s train systems in San Francisco and Silicon Valley cost two to three times as much as those in Seattle after accounting for home size. Not all Seattle neighborhoods see higher prices just for being near a train stop, but the vast majority do. In Seattle, the median cost citywide for a house this year is $384 per square foot. But near the seven stations between the stadiums and the University of Washington, it typically costs between $403 and $605 per square foot, Estately said. The exceptions come if you’re willing to wait a while. At the north end of the system in Lynnwood, where service is scheduled to start early next decade, prices near the planned station are actually a little cheaper than the rest of town. Same goes for the home costs near the coming Kent/Des Moines station on the south end. But even that strategy is limited: In Northgate, where a station is planned for the coming years, the cost to buy near the stop has been $493,000 this year, an extra $18,000 compared with the rest of the neighborhood. Ditto for the coming stop in Mountlake Terrace. Overall, the Estately map shows homes along the Link line on a cost-per-square foot basis are priciest in downtown Seattle and on the Eastside and cheaper on the north and south ends, just as they are in general. The report did not look at rental rates near transit stops, or costs near bus stops.